The tidal force acting on the oceans generates tidal currents due to the tractional component parallel to the surface. This is because horizontally there is no net gravitational force acting to counteract motion. This tractional force reaches a maximum at around 45 degrees to the central tidal bulge. Chiefio has a nice article describing how the declination of the moon during spring tides can effect induced currents in the polar regions. Fig 1: Diagram showing how the tractional tidal component at the poles depends strongly on the lunar declination angle. I have been using the JPL ephemeris and the French INPOP10 ephemeris to investigate how this has varied over the last 2000 years. I calculate the maximum net annual tide based on the positions of the sun and moon, the maximum tractional component at 65N (arctic circle) and what I call the ‘melting index’. The melting index is meant to represent an extra ice melt influence of tidal motion working with summer insolation. It is zero during the arctic winter and proportional to average daily insolation times tidal acceleration in summer. Fig 2: Recent daily tidal components. 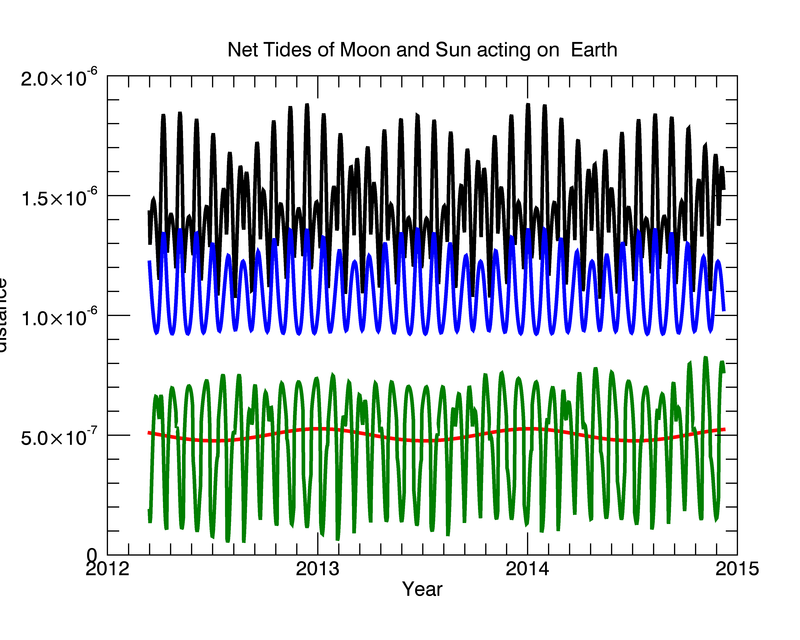 The lunar tide is shown in blue, the solar tide in red. Green shows the tractional acceleration at 65N. The tractional component at 65N typically varies between zero and half the net tidal force. The daily variations in tides show a rich structure of spring and neap tides enhanced by perihelion of the earth and lunar orbits. However are there long term changes in these cycles affecting climate? Next I looked at the long term dependence by calculating for each year the maximum for each tidal component. Figure 3 shows the annual maximum tides and their tractional component at 65N. There is a regular oscillation of ~8.8 years in the tractional force with the precession of the lunar orbit. However if we instead find the maxima of the tractional component at 65N independently to the maximum annual tide then there is a far more stable dependency. The following plot shows the maximum tide and the maximum tractional acceleration calculated independently for each year. Superimposed in red is what I call the ‘melt index’ which is defined as the tractional acceleration weighted by its offset (in days) from midsummer maximum insolation (June 21). Fig 4: The black curve shows the annual maximum tide. The blue curve shows independently the maximum tractional tide at 65N. Both are essentially constant with time. However the melt index shown in red shows a regular ~40 year cycle showing coincidence of maximum tide and high summer insolation. The maximum traction at the poles is now also nearly constant but there is a definite cyclical effect on the timing with the seasons in which they occur, as picked up by the melt index. If we assume that large tides combined with high insolation enhances the arctic ice summer melting then this follows a roughly 40 year cycle. This graph is a zoom in on the last of the period 1600 – 2100. If the tides influence the summer melt then we would expect to see a roughly 40 year regular variation in ice extent. Conclusions. I find no evidence for variations in inter-annual variations in the maximum tides on earth over a 2000 year period using either JPL ephemeris or INPOP10. The maximum tides however show an 8.8 year variation in their tractional forces at the arctic circle (65N). However if instead we calculate the maximum tractional force independently then I also find no long term variation. The only variation which may effect polar climates is seen in the timing of the tractional force with the seasons. The occurrence of maximum tides in the arctic coincident with maximum solar insolation does have a ~40 years cycle. The tidal currents thereby induced may effect the summer melting of sea ice. Next I will look at far longer timescales into the influence of Milankovitch cycles on the earth’s orbital eccentricity which directly affects tides. This entry was posted in Astronomy, Climate Change, climate science, Paleoclimatology, Science and tagged Arctic, Moon, Tides. Bookmark the permalink. Interesting, are there any other 40 year cycles showing up in Climate? Vey well done. I think you are on to something. Iben Browning used to say that high tidal forces increase volcanic activity which can cause cooling when the ash gets into the stratosphere. I think he also mentioned that increased sunspot activity causes warming but the two combined whip the jet stream up and down making for a farmer’s nightmare. 12/15/2017 has the highest tidal force in 368 years, so would seem to be a pretty good trigger. After he died, I don’t think his daughter, Evelyn Browning Garis, focused on these areas very much. Do you have any thoughts on this?